I feel like I fell of the edge of the earth and just found my way back. I haven't posted here for 3 months. I can hardly believe it has been that long. How can that much time go by and achieve so little. I also caught up with other things I haven't done for a while - like since last April. 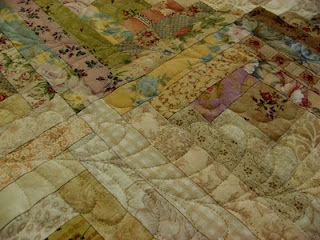 Oh well, at least I finally got one more quilt done. It was on the machine for a while but now just need to wash and it's ready to use. 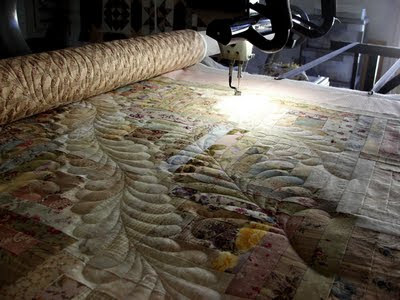 Will be nice to have a new quilt for our bed.........the one on there at the moment was made about 7 - 8 years ago and getting a little faded, but still lovely and shabby and cuddly. One of my favourite blocks if Log Cabin. 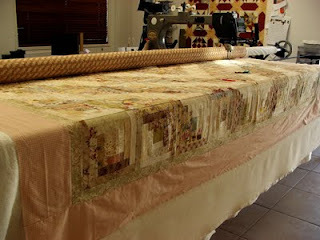 I had made one of these for a friend and while I was quilting it was feeling pangs of separation and thought "Hey, this is what you do so just make one for yourself". And it will be great to have a minus to report on Stashbusting. 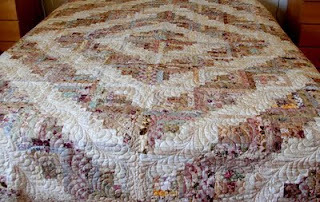 Lovely to see you back, Maggie and your finished quilt is breathtaking - the quilting just wonderful! Wonderful work Maggie and it's great to see you back blogging. Didn't hear from you for Jenni Kelly workshop. I was hoping everything was ok with you. Thanks for putting our BAVA blog on your Blog list here. 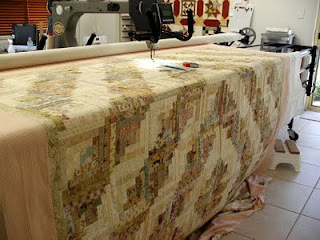 Love the quilting, do you freehand the feathers?